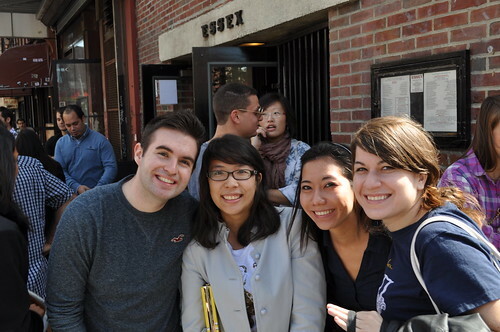 With some of my good friends visiting from out of town (thanks to Dan, Krystal, and Ariana for coming out to visit us! 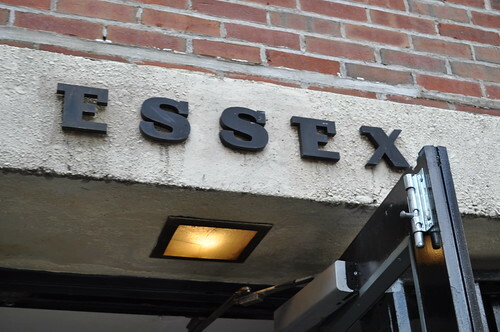 ), I decided to bring them down to the Lower East Side for a casual Manhattan-style brunch at Essex. The fare offered on Essex's brunch menu is comprised of the typical breakfast/brunch egg classics (eggs benedicts, three eggs any style, steak and eggs, etc.) along with some hints Latin and Jewish cuisine in there. Very eclectic, indeed. A look inside Essex, where the bar areas bleeds into a dining room in the back and up on the loft area. We arrived 15 minutes before our reservation, only to be seated a half an hour after our actual reservation, so we stood waiting for about 45 minutes before we were called to be seated. A little frustrating, especially when you have some caffeine-starved guests on your hands, who just want to sit down and have a cup of coffee already! Luckily, the food and drink were great, so it was worth standing for that long. I will have to say that Essex certainly offers one of the best deals in town for brunch -- three brunch cocktails (many times the servers are more generous than this!) and one main course for $22.95! 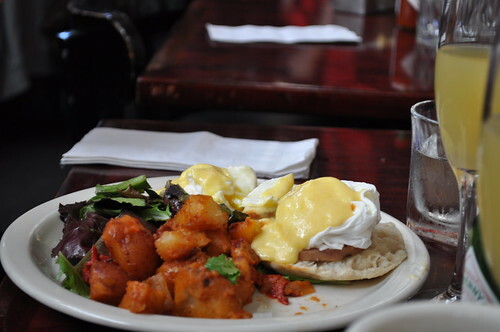 Can't beat that, so prepare for a happily drunken brunch coming your way if you plan to visit Essex for brunch. 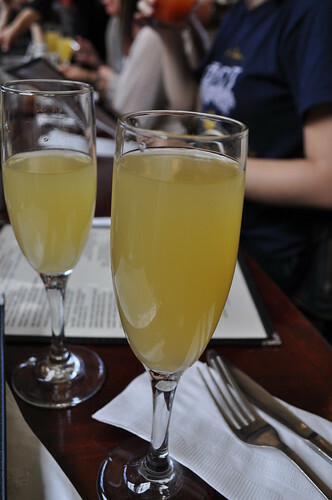 Our first mimosas, which then carried onto 6-7 throughout the duration of the meal, so let's just say, it got a little crazy. 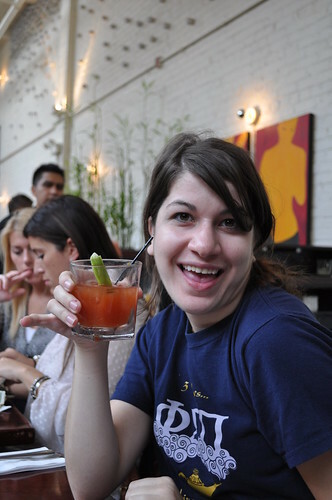 Ariana was brave (in my eyes, at least) and ordered a much needed Bloody Mary. I had never had one before, and at first taste, I thought it tasted like cocktail shrimp sauce. My mind was blown when I found out that a spicy condiment (Tabasco sauce, in this case) is part of the concoction of a Bloody Mary cocktail. I thought it was just tomato juice and vodka! I've never warmed up to tomato juice, which is probably why I never attempted to try one. Nevertheless, that's one off the bucket list. While we were waiting for our main courses, Essex started us on some roasted onion bread. Very fragrant and strong flavor. Ariana had ordered something I would not have typically considered ordering -- it was the Manchego macaroni and cheese with chicken apple sausage. I didn't think it'd be good, but it caught all of us by surprise. It was pan-fried to lightly burnt cheesy perfection. 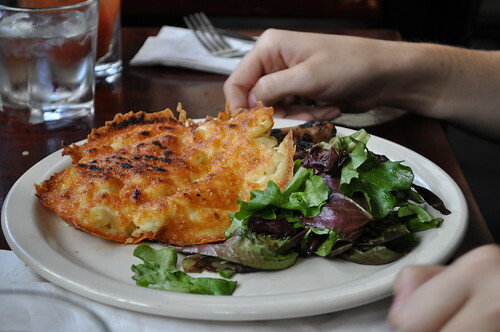 Please order this if you're in the mood for something cheesy or if you're just ready to be blown away by brunch. Krystal had the eggs benedict with Canadian bacon -- pretty solid brunch choice here. It had everything one looks for in a nicely prepared eggs benedict. Nice consistency in the Hollandaise sauce and lightly poached eggs resting over some tender Canadian bacon. 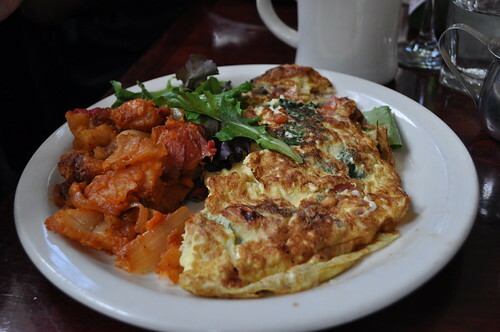 Dan had the omelet of fresh spinach, tomatoes, sheep's milk cheese, and chives, which he found to be quite delicious. An omelet with the standard veggie and cheese mix is always a safe bet. 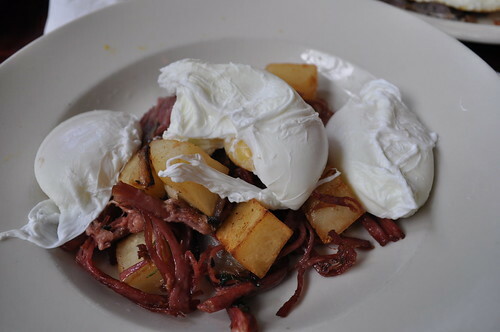 I had the corned beef hash with three eggs any style, where I decided that I wanted them poached. While I love the fried slops of canned corned beef hash found at those greasy roadside diners (how can any Jersey native hate on our beloved diners? 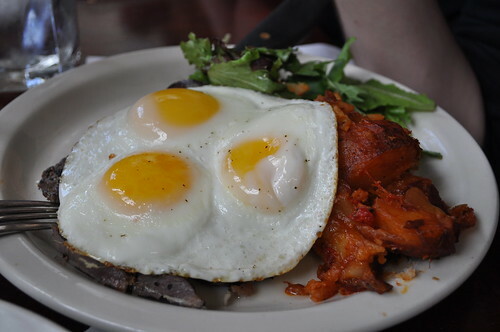 ), it was great to see the corned beef hash use fresh corned beef and cubed potatoes in the mix. The eggs were poached exactly how I like them -- with soft yolks and a runny center. Marcus had the grilled ribeye and eggs. Even with the $2 supplement to the prix fixe price, this was totally worth all that. The ribeye was beguilingly delicious -- it didn't look all that appetizing until you tried a piece. Oh man, it was glorious. Tender and soft -- not at all chewy like steaks I've had in other "steak & egg" diner plates. The home fries had an interesting spice to them, and I liked that the potatoes were really soft with no undercooked crunch. 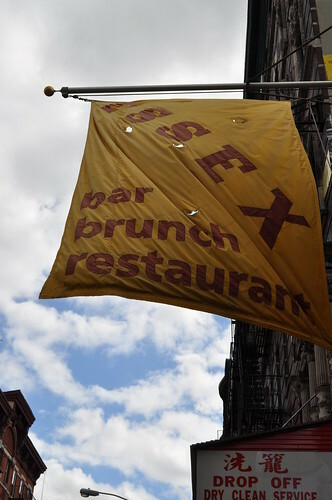 Findings: Besides what I've heard about Calle Ocho (still have to make it there by the end of the year -- I'm determined), Essex and its prix fixe brunch (i.e., one main course and three brunch cocktails) is one of the best brunch deals in town. 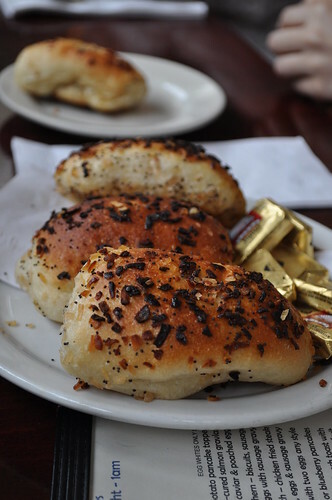 You'll leave pleasantly buzzed (or even better, tipsy and happily drunk) with a satisfied stomach intact. I like the variety of items offered on the menu (classics mixed in with some original ones). Only thing I caution is that even if you do make a reservation, be prepared to wait until your table is actually ready. Other than that, you'll be glad you waited. The service isn't amazing, but they'll get you the cocktails you'll need and your food will arrive eventually. After all, they need to turn tables around so they can seat their guests as prompt as possible. 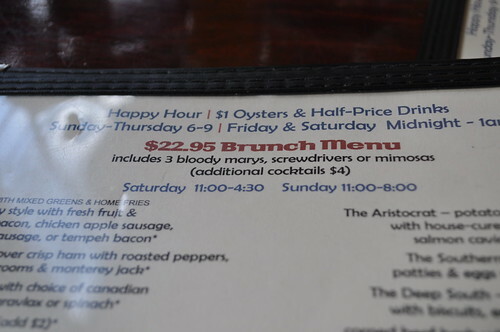 Price point: $22.95 for one main course and three glasses of brunch cocktails (i.e., your choice of bloody mary, mimosa, and screwdriver), $2 supplement for grilled ribeye and eggs. I can't believe you haven't been to Calle Ocho yet. As far as I know, Calle Ocho is the best brunch place in town. 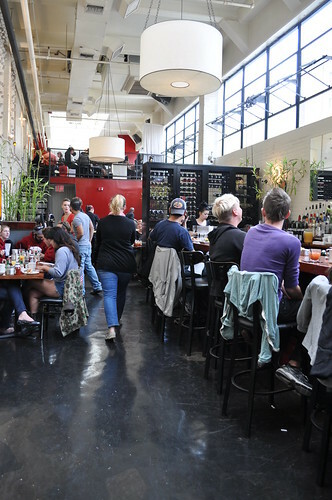 You can get wasted for under $20 because their brunch specials come with unlimited sangria. With that being said, I like Essex more for dinner. Their spicy tuna tarte was amazing! Definitely have to make it there ASAP -- reservations are just so hard to come by! I feel like I always call a moment too late. Will have to get on that pronto! :) Thanks for the tip!